Adults spend on average $2,800 on an engagement ring for their loved one. It is one of the most important purchases in a relationship, with the ring traditionally been worn on the left ring finger. Engagement rings are used as a symbol of your love and commitment when you propose to your loved one. Many modern couples decide to go engagement ring shopping together, after the proposal, or forgo the engagement ring all together! If you choose a custom, high-quality engagement ring, it will be timeless in years to come. From Hollywood to the Royal family, we have rounded up the top 10 most beautiful engagement rings in history. This 12-carat blue sapphire diamond halo ring is arguably one of the most famous engagement rings in the world. The ring was originally worn by Princess Diana in her engagement and marriage to Prince Charles. After her passing, the ring was given to her eldest son Prince William. The Duchess of Cambridge, Kate, now sports the bright blue ring given to her by William in 2010. The ring cost £28,000 at the time of purchase but is now worth over £300,000. Brad Pitt spent a year custom designing this ring to give to Angelina when they got engaged in 2012. The emerald cut 10-carat diamond ring cost Brad Pitt $1 million. Kim Kardashian would never have a small and simple engagement ring. This ring is beautiful with a 15-carat cushion-cut diamond and costing Kayne West $8 million when they got engaged in 2013. In comparison to the rest of the celebrity world, this ring is very small. With a cost of $30,000 for the 3-carat ring, Ryan Reynolds proposed to Scarlett in 2007. Prince Harry had a custom ring made containing the 2 outer diamonds from Princess Diana’s personal collection. The large central diamond, set on a gold band, is from Botswana. Both Meghan and Harry spent a lot of time in Africa together undertaking charity work and going on holiday there. This personal touch really suits the royal couple who got engaged in 2017 and married just last year. Experts estimate the ring is around 6 carats in total and worth $200,000. Elvis gifted Pricilla with a 3.5-carat yellow diamond ring surrounded by 20 smaller diamonds in 1966. They ended up getting married at an intimate ceremony in Las Vegas not long after the engagement. Marilyn’s ring was technically her wedding ring, but the unusual design has led itself to be on this list. Marilyn received a platinum eternity band from Joe DiMaggio containing 35 baguette-cut diamonds when they married in 1954. It was put to auction in 1999 and sold for $772,500. The simple design of an eternity band is a popular choice for couples today. John F. Kennedy proposed to Jacqueline in 1953 with a very unique engagement ring. The ring had a diamond open halo and emerald combination totaling 5.6 carats. Audrey Hepburn was a trendsetter and started some of the fashion trends that are still popular today. Mel Ferrer gave her 3 engagement rings in 1954 and Audrey wore them as stacked rings. Each ring contained a small diamond, but they were made from different types of gold. One ring was white gold, one rose gold and one yellow gold. Stackable rings are now a trend in 2019 with most stores stocking them! Elizabeth gathered many rings in her life over her 8 marriages, but the ring that really stands out is the one given to her by Richard Burton. An enormous 33-carat diamond ring, with the diamond later named after her. 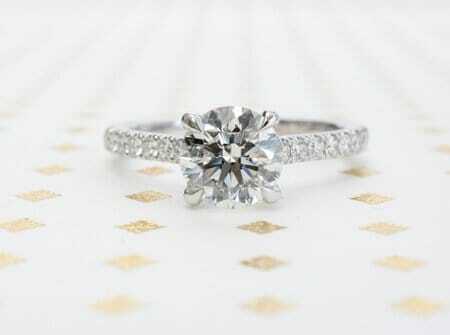 This ring was one of the most beautiful engagement rings in history. Mike Todd, another of her husbands, also gifted her with a 29.2-carat emerald cut diamond ring. What Makes the Most Beautiful Engagement Rings Expensive? There are 2 parts to most engagement rings: the stone and the metal band. Diamonds generally are the more expensive stone. Diamond value is based on size, color, and clarity. A diamond that has inclusions not visible to the naked eye would be cheaper than a perfect diamond. If you are wanting a 1-carat diamond ring, consider purchasing a 0.95-carat ring instead. The cost of diamond rings tends to go up significantly per carat. Another stone is worth considering too, like an emerald or sapphire. There is a negligible difference in durability between 14k and 18k gold, but a substantial price difference. Further, platinum is a hard-wearing metal but is also expensive. There are options like silver or white gold if you like the platinum look but aren’t keen on the price tag. If you are in search of the perfect engagement ring, get in touch with us today. We would be more than happy to help and have a ring to suit all budgets. We also have the prettiest wedding rings available in Toronto. It is a good idea to purchase an engagement and wedding ring that compliment each other and sit well on the finger. If one of these most beautiful engagement rings looks like a ring you are after, we do custom designs too. Famous rings are often the source of design for many looking to have an original ring made for their loved one. See our engagement rings page for more information.